Cookware that works on induction cooktops can be used on all types of cooking surfaces. This versatility is beneficial to those who have both conventional ranges and a portable induction hob. How to Use an Induction Cooker? What is an Induction Frying Pan? What is the Symbol for Induction on Cookware? 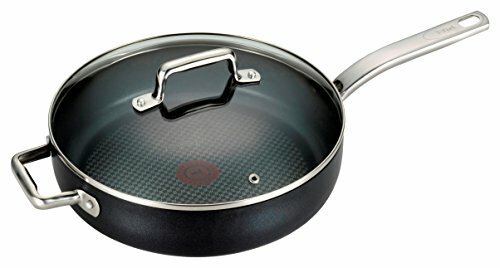 T-Fal has been a leader in cookware for a long time and the variety along with the reputation of the brand makes them a leading competitor in all types of cookware. The T-fal C51782 ProGrade Titanium Nonstick Thermo-Spot Dishwasher Safe PFOA Free with Induction Base Saute Pan Jumbo Cooker Cookware, 5-Quart, Black sauté pan is an excellent choice for families to add to their cookware collection. It has high consumer ratings and is a good starting point when building an induction cookware set. 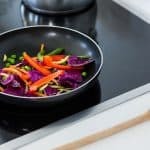 There are benefits to using this sauté pan on induction cooktops, so let’s take a look at some of the highlights. This T-fal sauté pan is made of hard titanium that’s reinforced with a non-stick interior and designed to last for years. In addition to the stainless steel base that makes for induction compatibility, it also has ergonomically designed stainless steel handles and a thermo spot heat indicator that notifies the cook when the pan is properly pre-heated. Aside from the reasonable price of this induction compatible sauté pan, the non-stick interior makes it easy to cook a variety of different foods without having to worry about scraping the residue off the surface. The limited lifetime warranty provides assurance that says you’re working with a durable pan. Another benefit to the sauté pan is it is oven safe up to 500°F. The T-Fal induction compatible sauté pan is rather large and heavy on its own, so once the food is added, it only gets heavier. Due to the size, it’s not something that I would recommend for individuals cooking for themselves. However, it is suitable for families since it holds a large quantity of food. Reviewers have commented that oil seemed to pool around the edges, requiring a low-medium pre-heat to get an even temperature. The design of the sauté pan calls for a lot of stirring of the food because of a slightly raised center. Cook N Home is an e-commerce store that specializes in selling cookware, kitchenware, and housewares. Affordability and durability are only two of the reasons that we wanted to challenge it against other induction-ready cooking pieces. The Cook N Home 02441 Stainless Steel Saucepot with Lid 12-Quart Stockpot, Qt, Silver is made of 18-10 stainless steel with a mirror polish that not only helps with durability, but also makes it easy to clean. The aluminum disc layer at the bottom of the saucepan provides thorough and even heat distribution while avoiding hot spots. Riveted handles have been reinforced to provide secure carrying of hot and heavy items. The tempered glass lid with a vent allows the cook to keep an eye on the food as it is being cooked. The large size of this stockpot offers multipurpose cooking. Some consumers use this pot for canning/jarring. It is oven safe up to 350ºF. This stockpot can be used on gas, electric, ceramic and halogen cooktop in addition to induction. This stockpot is ideal for canning and jarring because of its size and it isn’t too heavy to manage. There’s a rubber edge on the handles that is helpful because it would make it easy to carry. Reviewers have raved about their success using this pot on their induction cooktop. They commented that the food was evenly cooked. 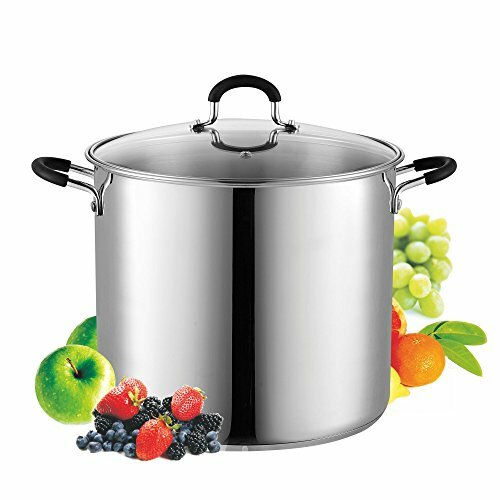 While cooking large amounts of food isn’t something that suits everyone, this is an excellent stockpot for those who enjoy cooking soups and do a lot of canning. Another benefit is that it comes in a variety of sizes and it is easily cleaned. This pot is a quality item and performs very well on induction cooktops. However, like most items, it has minor drawbacks. Some people have noticed a slight rainbow-looking finish at the bottom of the stockpot after a couple of uses. However, this in no way affects the usability. This is not the type of pot that should be used to cook food at high heats as it gets quite hot when the contents reach a boiling point. However it can be used when simmering soups, etc. Additionally, the lid is said to be not as secure as folks would have liked it to be. Once you’ve purchased an induction cooktop, it’s only logical that you seek out cookware to get the most out of your purchase. There are plenty of options on the market that could make your decision a difficult one. Instead of feeling overwhelmed with the variety of choices available, doing some simple research and reading up on what you should look for in induction cookware could save you a lot of time and a lot of money. You can use this guide that we put together to help you go forward with your purchase. Cooking styles with induction cookware are the same as with regular pots and pans, but the cookware is designed in a way that heat will be evenly distributed. 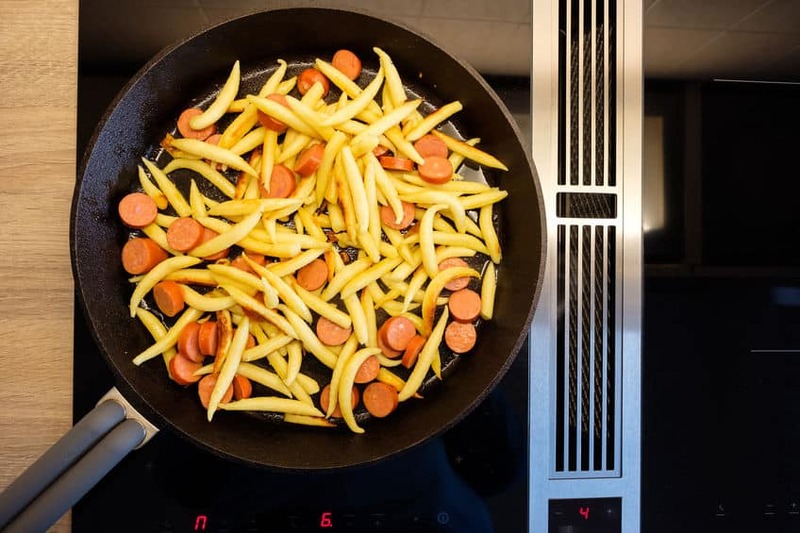 The cookware is made to work best with induction cooktops, and it even heightens the flavor of food, but they can be used on regular cooktops too. 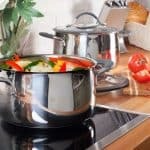 Due to the variety of induction cookware on the market, there are many materials that are used when constructing durable pots and pans. The main thing to keep in mind is that they need to get made with a high content of ferrous metal at the base to make it magnetic. Magnetic stainless steel, cast iron, iron, and black metal pots and pans are typically induction compatible. 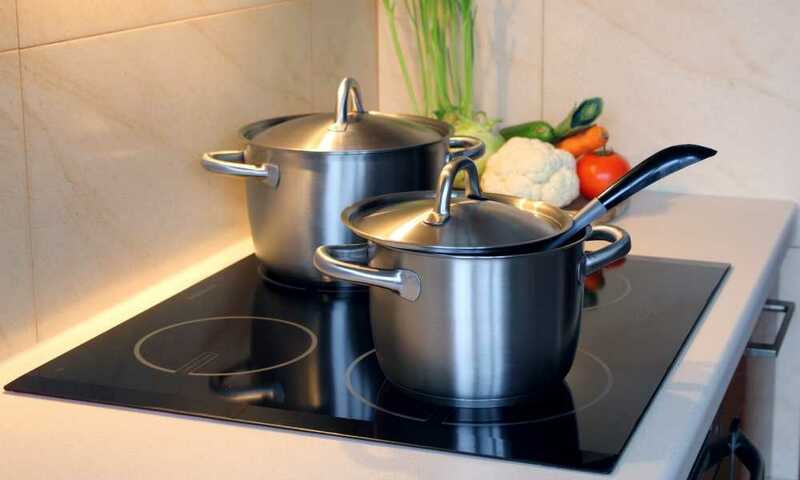 However, if you question whether or not your current set of cookware can work with induction cooktops, just test the bottom of your pots and pans with a magnet. If it sticks securely, then it is induction-ready. There are multiple types of ply cookware available for purchase, though the majority of them are either 3-ply, 5-ply, and 7-ply. The “ply” element refers to the layers of metals that are used in the build of the pots and pans. Each of the metal layers, or “ply,” has its own purpose, and the more ply, the thicker and more versatile that the pots and pans are. Using different types of metal in one pot or pan allows for more features and benefits to be introduced into a single piece of cookware. 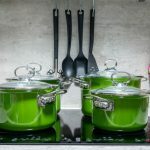 When choosing the size of your induction cookware, it’s best that you know the type of cooktop that you’re going to use, as well as the kind of cooking you’re going to do. Induction cookware has been designed to provide even heating, though specific pots and pans are best used for certain things. Purchase the cookware that best suits your cooking needs, and take a look at whether it primarily targets cooking for one person or if it’s best suited for family cooking. While there are some induction compatible cookware sets and individual pieces that are lightweight, the majority of them do have extra weight to them due to their design. 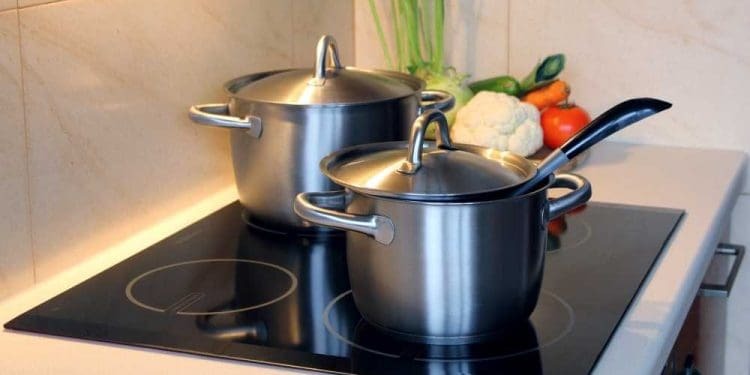 Induction cookware is typically designed to withstand high temperatures without warping, and many sets include multiple ply (or layers) of metal that add weight to the pot or pan; the more layers, the heavier it is. If you are in a situation where you require lightweight induction cookware, consulting with a sales associate at a homeware and kitchenware store could help you find what you need. Alternatively, you can take a look at the weight specifications in product descriptions to determine if it is the weight you want. Choosing between stick and non-stick induction cookware depends on the type of cook you are and your personal preferences. There are pros and cons to both, and it’s a matter of determining where you stand. Many consumers prefer non-stick pots and pans because they are easy to clean both before and after cooking. Less oil needs to be used because the cookware has been designed to prepare an array of foods without it sticking. However, many people enjoy regular cookware because it provides the desired sear and browning effect when cooking food. They’re also usually more durable and oven safe. The downfall is that they do take some extra time to clean. Using an induction cooker is just like using any other stove, with the exception of a few things. With the majority of induction cookers, the element turns off if it doesn’t recognize a pot or pan on the burner. 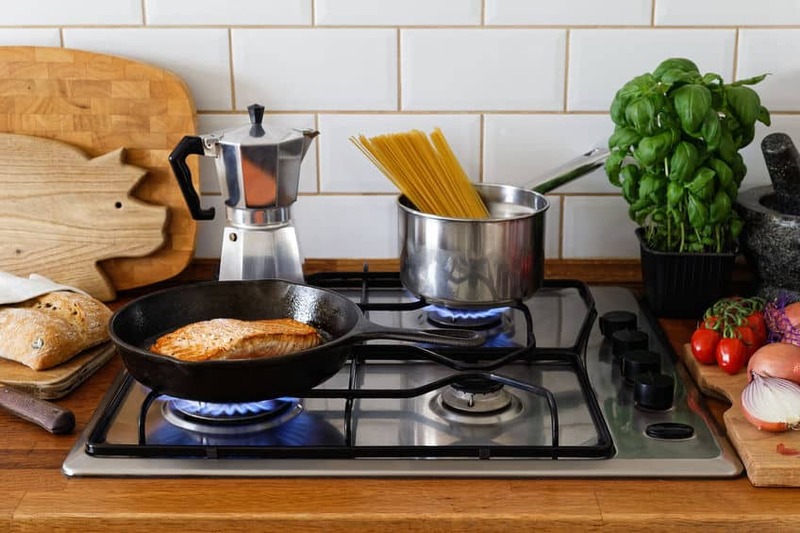 Once you’ve made sure that both the burner and the bottom of your cookware is clean and dry, simply put the pot or pan on the element and ensure that it’s aligned so the center of the cookware matches with the center of the burner. From there, adjust your temperature settings to pre-heat your cookware or begin boiling your water. You can find step-by-step instructions with the user’s manual that come with your induction cooktop. 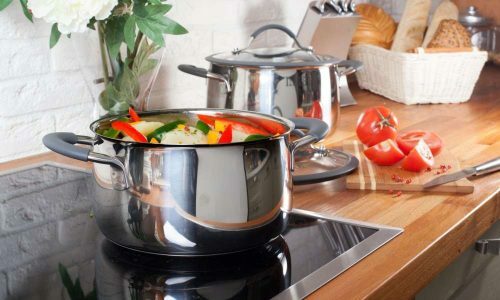 Induction-ready cookware looks just like standard cookware because the science behind making it induction compatible is hidden within the construction and design of the pots and pans. The base of the cookware gets built with a magnetic support that works with the magnetic currents that induction cooktops give off. Stainless steel, aluminum, copper, cast iron, and iron pans are all examples of induction compatible cookware. Induction-compatible pans are the only ones you can use on an induction cooktop. To sum it up, induction-ready pans have a magnetic base. You can test out your current pots and pans by holding a magnet to the bottom to see if it sticks. If it does, then it will work with your induction burner. Also, you can look into purchasing cast iron, stainless steel, black metal, iron, or aluminum pots and pans that indicate they are induction ready. You can find out if they are ready by looking for the induction symbol, or by reading product descriptions. Induction frying pans are frying pans that have been designed to work with induction cooktops. They have a magnetic base that works with the electrical current that induction cooktops use to generate heat. The symbol the represents induction cookware is a series of swirls inside of a square.